#BrunchWeek is in full swing. There have been a ton of great recipe so far. 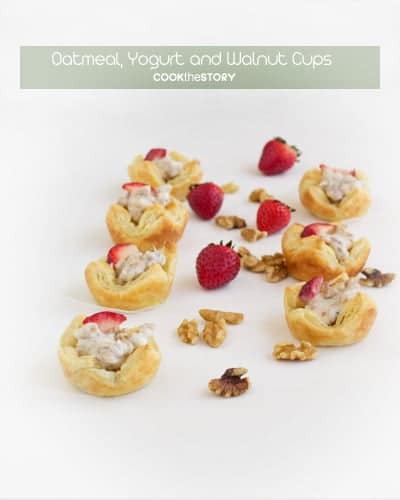 Today I’m sharing a make ahead recipe for Granola, Yogurt and Walnut Cups. Don’t forget to enter our BrunchWeek giveaway. Click on the image of all the prizes below to go and enter. We’ll be announcing the winners during our PinChatLive on Saturday May 11th, 2013 between 2 and 3pm Eastern on this BrunchWeek Pinterest Board. Join us for a chance to win more great prizes. Note: BrunchWeek and all the accompanying giveaways ended on May 11, 2013. But come back soon for more exciting news about the themes and giveaways that will be happening. Whenever I have company over to eat, my goal is to spend as much time with my guests as possible. That means that I like to have everything ready ahead of time. My brunch suggestion for today is a make ahead recipe. You can make these cute little cups up to three hours ahead. Cover and refrigerate them until it’s time to eat. Before I share my little make ahead brunch recipe, I have a video about brunch for you to watch. It’s a chat with Katie from Katie’s Cucina and Terri from Love and Confections. We talk about our favorite brunch recipes and also give tips for pulling off a stress-free brunch. And of course, using make ahead recipes is one of the things we suggest! Be sure to scroll down and check out the rest of the great brunch recipes, too! This recipe is an ode to some of our #BrunchWeek sponsors. We have Bob's Red Mill Granola, thick and creamy Stonyfield Greek Yogurt and California Walnuts. I've used strawberries as a garnish because they're in season right now. But it's even better with cherries. Let me tell you, cherries and walnuts together? It doesn't get much better than that! Grease the cups of one 12-muffin muffin tin and half the cups of another. Unfold the defrosted sheets of puff pastry. Cut each sheet into 9 squares by cutting each lengthwise into 3 equal strips and then cutting each strip into 3 squares. Lay each square into a greased cup of a muffin tin. Make a bunch of holes in the bottom of each piece of puff pastry using a fork. Bake for about 14-16 minutes, until the tops are puffed and just starting to brown and the bottoms (if you pop one out to check) are as golden as California's best walnuts. Remove pans from the oven. If the middles have puffed up on any of the cups, pierce them liberally with a fork again to settle them down. Remove the puff pastry cups from the muffin tins and put them on a rack to cool. Meanwhile, combine the granola, walnuts, yogurt and maple syrup in a medium-sized bowl. Stir well. When the cups are cool, transfer them to a serving platter and spoon a heaping tablespoon of the granola mixture into each one. Top each cup with a sliced strawberry and serve or cover and refrigerate for up to 3 hours. These seems like they would be great not only for brunch but also for an afternoon tea. Thanks for sharing. Aren’t those cute, perfect idea for brunch!! I like that you can make these ahead of time and save time on the day of the actual brunch. How cute!! I love this idea! Cool way to make individual servings of granola! I love anything with puff pastry. Adorable cups! And they look so tasty! Great video chat.